Where an ice cream shop like Milk builds layered, elegantly crafted milkshakes replete made with superlative ingredients in carefully constructed combinations, Millions of Milkshakes devotes itself to diversity, an array of candy, fruit and syrup toppings in a mind-boggling array of permutations. 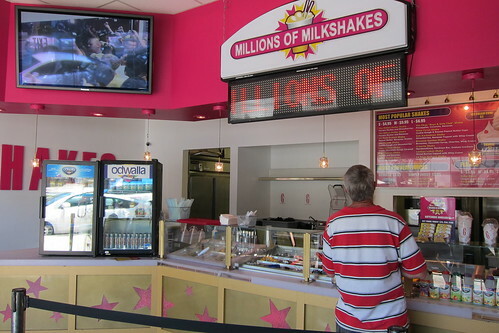 If Milk is an Oprah book club selection, Millions of Milkshakes is a Jackie Collins novel. It's crass and blowsy, happy to sacrifice any pretense of quality for the brief whiff of fame that C-grade celebrities can bestow. Did you know that La Toya Jackson prefers her shake with pineapple, bananas and strawberries? Or that Heidi and Spencer like mangoes and pineapple topped with whipped cream? Or that Dancing with the Stars contract player Karina Smirnoff stuffs her shake with Oreos, brownies, Ferrero Rocher chocolate truffles, chocolate syrup and chocolate chips? (Good thing she has months of dancing to burn off the calories.) Neither did we, but the 80+ "celebrity shakes," listed prominently on the menu in alphabetical order, help give make some sense of what can otherwise be a daunting litany of choices. 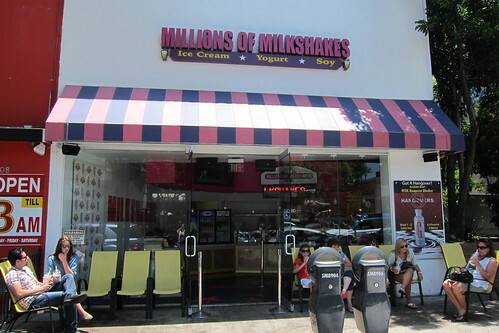 The flagship store, near the corner of San Vicente and Santa Monica Boulevard in West Hollywood, is small and very pink with flat-panel TV screens broadcasting an endless loop of celebs making milkshakes in the store. (There's Lil' Kim mixing banana, strawberries and Nutella!) It seems designed mostly to capture the tourist trade and, since it's open until midnight on weekdays or 3 a.m. on weekends, any locals who might need a quick fix after hitting one of the nearby bars. The variety of toppings, if not ice cream, is impressive, everything from gummy bears and Twix bars to healthier fare like fresh bananas and berries. There's even protein powder for bodybuilders with a sweet tooth. Chocolate fanatics may be disappointed as the promised "chocolate hot fudge" is just chocolate syrup. The blenders are perpetually set on pulverize, so if you were hoping to bite into chunks of Snickers or Kit Kat, you'll be disappointed to find them ground to a gritty pulp. Textural variety be damned. The milkshakes are not, in theory, overly expensive. They start at $3.95 for the smallest size, which comes with one topping. Above that, toppings cost $0.95 each. As anyone who's ever thrown caution to the wind at Yogurtland can attest, that's how you end up with an $8 cup of ice cream. 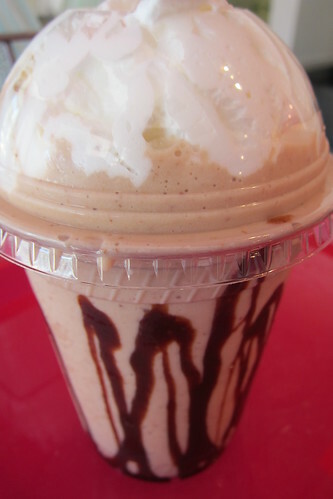 Still, Millions of Milkshakes is fun and goofy, if not terribly sophisticated.